Colin and Bianca explain this attempt. Everesting is a concept in cycling which requires the participant to ride up and down the same hill until they have ascended the same height of Mount Everest (8848m) in one session. Breaks are allowed and the participant can take as long as they need however no sleeping is allowed. We have chosen De Beer’s Pass in Kwazulu Natal to attempt this feat on our Qhubeka Buffalo bikes, 25kg steel frame rigid workhorse bicycles. This father-and-daughter pair are always up to something. Colin recently cycled across Europe, a 5,000 kilometre unsupported bicycle tour on his Qhubeka Buffalo bike. Read about this Three Rivers Cycle Tour on his blog. 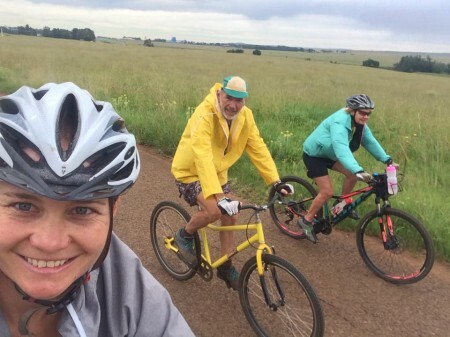 After the Thaba Trails 24hr cycle event was cancelled, Colin and Bianca devised a ‘Triple Challenge’ – riding 1000 kilometres in 10 days on R10 a day. Sign of the times that we didn’t think we would be able to replicate the original budget of R10 a day! As per the back to basics rules, we would be eating no processed foods and drinking only our homemade sugar-salt solution while out on the bicycles. We made our own peanut butter, jam and bread. We decided to ride to Parys and back from Bianca’s home in Alberton, with a ride around Parys on day 2. You can read about this adventure and see their shopping list and meal plan in this blog post on their website. Colin and Bianca spoke at FEAT in October 2015. Here is the video of their talk. Keep an eye on their mini and longer adventures through their Facebook page and their website.